The Ramona Community Library calendar for April 2019 is now available. Here are some of the April Special Events. AARP will be providing free tax preparation April 6. Registration is required by contacting the library. 3D Printer Workshop: Monday, April 8 at 3 p.m.
See how the 3D printer works and make your own design. Musical Showcase: Thursday, April 11 at 6 p.m. The Bassett Brothers is a guitar-playing twin duo who perform music from diverse genres. Growing Fresh Herbs for Cooking: Saturday, April 13 at 10:30 a.m. Learn to grow herbs in containers and your backyard garden. Learn to recognize common pests and diseases of herbs. Learn safe ways to prevent and control pests and diseases of herbs. Community Hero Storytime: Wednesday, April 24 at 10:30 a.m.
Bring the family to hear a story about Smokey the Bear, talk with our firefighters about fire safety. Firefighters will also give a fire engine tour. Ramona Family Fiesta- Día de los Niños: Tuesday, April 30 at 3 p.m. Celebrate Día with a health fair, Amazing Dana Magic Show, Folklorico dance performances, crafts, face painting, and free books. The Chamber hosted kick-off party for the Ramona Open Studios Tour will be held at 2Create Gallery on Friday, April 5th from 6 pm to 8 pm to view art and meet the artists. Guests are encouraged to bring family and friends. Light hors d’oeuvres and refreshments will served. For additional information about the Ramona Open Studios tour, please visit https://ramonachamber.com/ramona-open-studios-tour/. The Julian Historical Society will be open the first weekend of each month beginning January 6, 2018 10 am to 4 pm. Hope you will come visit with us. The Stageline Garage and Witch Creek Schoolhouse will be open the first weekend of each month (2018). 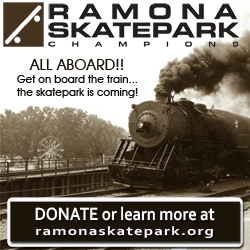 The Ramona H.E.A.R.T. Mural Project will hold a dedication ceremony for its 19thmural, “Bandy Blacksmith,” by artist Beata Wojcik at D’Carlos restaurant, 1347 Main St., Ramona, on Saturday, April 6, at 10:00 a.m. The public is invited to attend. In addition to refreshments, attendees will meet the artist and receive an autographed picture of the mural. The mural is of local Ramona blacksmith Tom Bandy working at his forge. Bandy is the great-grandfather of Keith Carnevale, manager of D’Carlos; who is also co-owner along with his mother Lin Carnevale, who was married to Carl, the grandson of Bandy. The Martin Luther King, Jr. Community Choir of San Diego (MLKCCSD) has been invited to return to Ramona and perform a Concert on April 7 at 3:00pm. You are invited to come hear a lively soul invigorating Gospel Music performance and learn about the history of gospel music in America. First Congregational Church, 404 8th Street in Ramona is hosting this performance and inviting the community to come enjoy the music. The MLK choir was on tour in Washington DC this past September and past performances include 3 European concert tours and two appearances at Carnegie Hall. Come and experience this joyful hand-clapping, toe-tapping concert. Now in their 21st season they perform under the direction of Ken Anderson, a Pastor and Director of the UCSD Gospel Choir and the Grossmont College Gospel Choir. The MLKCCSD is a non-profit charitable organization whose purpose is to raise funds which are distributed as SCHOLARSHIPS TO SAN DIEGO COUNTY GRADUATING HIGH SCHOOL SENIORS WHO WILL MAJOR IN VISUAL OR PERFORMING ARTS (applications are available online). 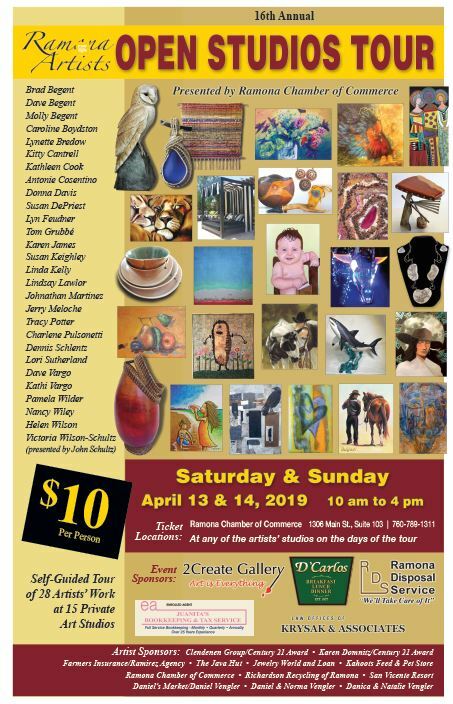 On Saturday & Sunday, April 13 & 14, the Ramona Chamber of Commerce presents the 16th Annual Ramona Open Studios Tour. You will have a unique opportunity to visit with area artists in their private studios, while viewing their work. This self-guided tour will meander through Ramona, allowing visitors to explore at their own pace. 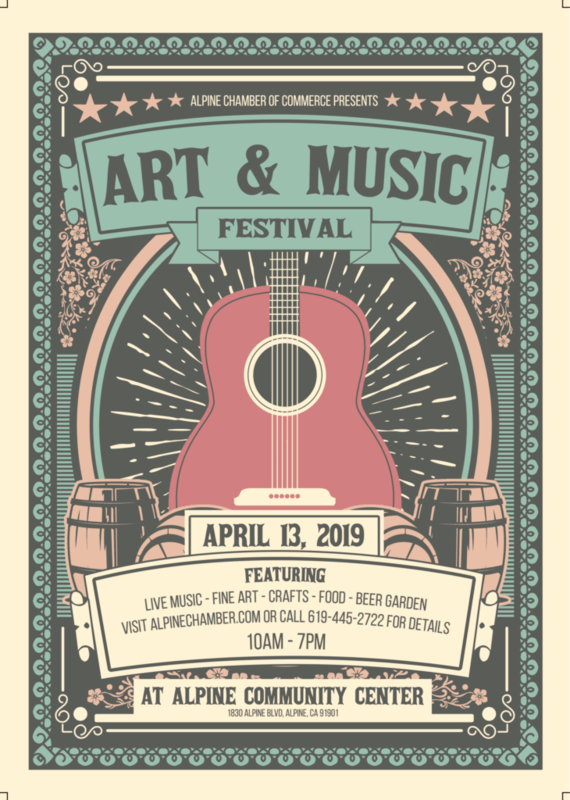 There will be 28 participating artists showing a variety of artistic expressions including painting, ceramics, jewelry, sculptures, fused glass and woodworking, which will be available for purchase. Tickets can also be purchased at any of the studios on the days of the tour. Hello amigos, Casa Rustica will be changing the Artisan Market event day to the 3rd Saturday of every month beginning April 20th from 10AM to 4PM. We would like to extend an invitation to local artists, craft persons and small businesses to come and join us now as we begin the Spring season. Please contact the store for more information. Casa Rustica 316 Main Street Ramona, CA 760 440-9836. Fort Cross’ 5 acre lilac farm will be open for lilac sales and a lot of fun! Hayrides, hoedowns, petting zoo, reptile show, candle dipping, vase painting, archery, tomahawk throwing, slingshot range, fairy & dino garden making, and quite a bit more! Reservations for activities are highly recommended. Lilacs for sale daily, until sold out. Put on your favorite boots, belt buckles & cowboy hats, grab your family & friends and join us for the 39th Annual Ramona Rodeo!